How Do You Estimate a Sale Price? Sales are great, but how much are you really saving? 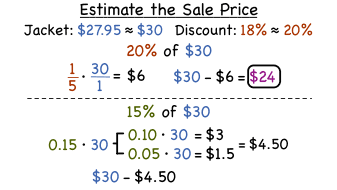 This tutorial shows you how to estimate the sales price of an item. How Do You Use Compatible Numbers to Estimate a Part of a Whole? If you're trying to find the percent of a number, it may be helpful to use compatible numbers to find an estimated answer. Follow along with this tutorial to see how to use compatible numbers to estimate the percent of a number! Use proportional relationships to solve multistep ratio and percent problems. How Do You Figure Out a Tip? If you need to leave a tip at a restaurant, you can quickly estimate the amount in your head! This tutorial shows you how to use estimation and mental math to estimate a tip!